It’s not uncommon to post something on Google+ and have a number of comments follow to the point that it becomes a discussion. When the discussion reaches a point where you want to move off the long-form text and have a live, face-to-face discussion, each Google+ post now contains a "Hangout" option at the bottom. Click it, and others who can see the post will be notified that you’ve started a Hangout, and they’re invited to participate. 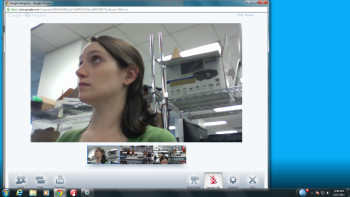 There's more to Google Hangouts than video conferencing. If you’ve done an On Air broadcast, chances are some of your audience missed parts of it, or even the entire event. To help with this, On Air broadcasts are now recorded and uploaded privately to your YouTube account, where you can share the video as you wish. This will allow you to build a library of content that your clients and customers can access on-demand. Hangouts are great, but until now you only became aware of them by seeing a notification on your Google+ screen. The new update not only shows up to three live hangouts on the right side of your Google+ stream, it also rings your device to let you know you’ve been invited. This strengthens the ability to use Hangouts for group meetings, with those you invite being aware of the Hangout, and those wanting to participate assured they’ll have an invite.